President Franklin D. Roosevelt privately wanted to restrict the number of Jews entering some professions and universities, and believed Jews should be “spread thin all over the world” so they would quickly assimilate, according to a new book about FDR’s response to the Holocaust. 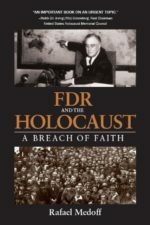 FDR and the Holocaust: A Breach of Faith reveals that Roosevelt remarked (in 1943) that “the complaints which the Germans bore towards the Jews in Germany” were “understandable” because there were many Jews in law, medicine, and other fields in Germany; FDR also claimed (in 1938) that the Jews were too prominent in Poland’s economy, which he blamed for antisemitism there. Because of his view that Jews should not be permitted to concentrate in professions, institutions, or regions, FDR promoted a quota on admitting Jewish students to Harvard in the 1920s; urged local leaders in Allied-liberated North Africa in 1943 to limit the entry of Jews into many professions; and in 1943 endorsed a plan to “spread the Jews thin all over the world” so they would quickly assimilate. * DISPARAGING REMARKS ABOUT JEWS: President Roosevelts private remarks about Jews included unfounded allegations about Jews dominating economies and professions in Europe; calling a tax maneuver by the owners of the New York Times “a dirty Jewish trick”; and proudly telling a U.S. senator that “there is no Jewish blood in our veins.” These attitudes of FDR’s played an important and previously unrecognized role in shaping his immigration policy and his response to the Holocaust. * NEW EVIDENCE ON REFUSAL TO BOMB AUSCHWITZ: American Jewish groups’ requests to bomb the Auschwitz death camp or the railway lines leading to it reached all the way to Roosevelt’s most important cabinet members. Previously, scholars had believed the requests were all handled by lower level officials. This book reveals that bombing requests were made directly to Secretary of State Cordell Hull and Secretary of War Henry Stimson, both of whom misleadingly claimed that the proposal did not fall within their area of responsibility. * RECOGNIZING FDR’S FAILURE: Although American Jewish leaders were among FDR’s strongest supporters during the war, many of them later expressed very different sentiments. In previously unpublished postwar interviews cited in the book, Jewish leaders acknowledge that they were “hoodwinked” and “taken in” by “Roosevelt’s charm,” that FDR’s “assurances” that he would help Europe’s Jews were “hollow,” and that in the end, FDR “didn’t lift a finger” to help Jewish refugees. The controversy over FDR’s bystanding during the Holocaust continues–as it should. Despite some efforts to justify Roosevelt’s behavior, the moral failure demands a full reckoning. In this book, Rafael Medoff gives us important treatments of various actors in the processes which led to Roosevelt’s actions and inactions. The volume is enriched by new documents and new reflections. This book should be read and taken seriously by everyone who is concerned with why President Roosevelt came up so short in dealing with the most total crime of genocide in history. Dr. Medoff provides one of the best overviews of the ongoing controversy about the question of what the Roosevelt administration might have done to avert, or at least mitigate, the Holocaust. The inclusion of dozens of original documents will make this work required reading for anyone working on this still controversial issue. FDR has been lionized–and for good reason. From the New Deal to victory in World War II, he proved himself one of history’s great world leaders. But did he do all he could to save the Jews of Europe during the Holocaust? In his excellent new book FDR and the Holocaust, Rafael Medoff reveals new and compelling research that sheds important light on this question. In the tradition of David S. Wyman’s monumental The Abandonment of the Jews, Dr. Medoff confronts some hard realities that are sure to make people rethink their assumptions about FDR’s response to the Nazi genocide. This book provides new and devastating revelations about the extent and depth of antisemitism among Franklin D. Roosevelt, several of those closest to him, and the State Department, and how it shaped U.S. refugee policy during the Holocaust. 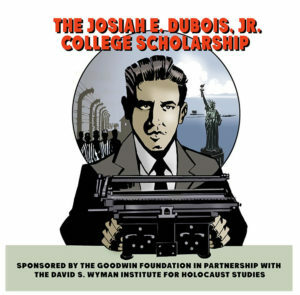 Dr. Medoff expands on David S. Wyman’s pathbreaking work, exposing the roots of the Roosevelt administration’s weak response to the lethal threat to European Jewry, from 1933 through the Holocaust. FDR and the Holocaust: A Breach of Faith is particularly relevant today at a time of widespread denial of, and indifference to, intensifying global antisemitism. For those who think of FDR as a friend and hero of American Jews, Dr. Rafael Medoff’s well written and documented expose of Roosevelt’s failure to attempt to rescue European Jewry from the Holocaust, is a reminder that Jews in America must never be afraid to speak truth to power. As a youngster in an American Jewish yeshiva, I was entrusted with the task of creating a memorial program to mark the passing of President Franklin Roosevelt. In later years, I sometimes imagined I could have been among the Jewish leaders who went to FDR to ask him to save Jews from the ongoing Holocaust. I imagined that when the great man stalled, evaded or double-talked, I would have mustered the courage to bang on his desk in the White House and demand that he rescue our people. Rafael Medoff’s superbly important, well-researched, and fascinating new book reveals the painful truth of what really happened when Jewish leaders met with President Roosevelt–what he knew, when he knew it, and why his reaction to the Holocaust was so pitifully inadequate.